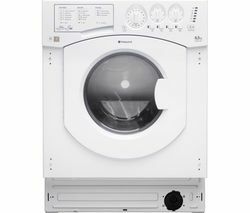 Hotpoint washer dryers are great for compact laundry rooms and homes without the space for two separate machines. And with the useful ability to set your machine to wash and dry in one setting, you can put your washing on before you leave for work and return home to fresh, dry laundry. Each one of our hotpoint washer dryer range comes with a minimum ‘B’ energy rating as standard, making them energy efficient and cost-saving for the household bills. With integrated options for fitted kitchens and models in white, black or graphite you’ll be able to match a Hotpoint washer dryer to your home’s look with ease. 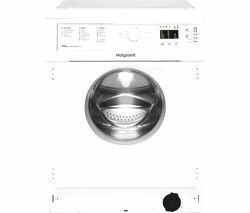 Be sure to pay attention to the washing and drying load capacity Hotpoint washer dryers, as the drying capacity is usually smaller by 2-3kg because drying requires extra space in the drum to help the warm air get to every inch of fabric. Indesit washer dryers offer a good alternative to the Hotpoint models, with many machines available for under the £400 mark for great affordability. And if you thought Smeg only made fridges, think again! With a one year warranty on all of our Smeg washer dryers you’ll have peace of mind and a machine that will last for years.